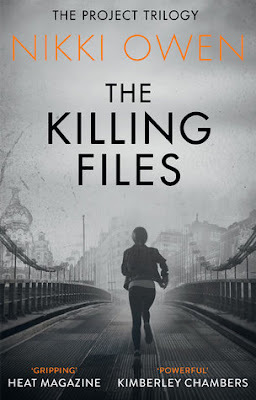 The Killing Files is the second novel in Nikki Owen's 'the project' trilogy, and it is outstanding! Dr Maria Martinez has finally broken free from 'the project' a top secret government project who have been experimenting on her since an early age. Maria thinks she is safe in her Spanish home, hidden away from the Project. Or is she? Despite her best attempts at total security she is rumbled by the project and back in their capture before she realised what has happened. Maria realises that she recognises the surroundings that she in, and the voice she is hearing, even though she is certain that they have nothing to do with the project. I don't want to say too much more, as these books are too good for you not to read for yourself. However, I will say this, there are some brilliant character additions to the series in this second novel, and I really can't wait to see where this trilogy is going to go next. A fantastic ending with some shocking revelations that appears to have everything wrapped up, but in reality leaves everything wide open with so many possibilities for the next novel. I am so excited for the third and final installment in this series, even though it will mean the end of a fantastic trilogy. I just hope the author has something equally exciting and original up her sleeve for the future, whatever it is, is sure to be a brilliant read. The Killing Files is available from 2 June 2016.